Fragments of fibronectin (FN) corresponding to the N-terminal heparin-binding domain have been observed to promote catabolic chondrocytic gene expression and chondrolysis. We therefore characterized FN species that include sequences from this domain in samples of arthritic synovial fluid using one-and two-dimensional (1D and 2D) Western blot analysis. We detected similar assortments of species, ranging from ~47 to greater than 200 kDa, in samples obtained from patients with osteoarthritis (n = 9) versus rheumatoid arthritis (n = 10). One of the predominant forms, with an apparent molecular weight of ~170 kDa, typically resolved in 2D electrophoresis into a cluster of subspecies. These exhibited reduced binding to gelatin in comparison with a more prevalent species of ~200+ kDa and were also recognized by a monoclonal antibody to the central cell-binding domain (CBD). When considered together with our previous analyses of synovial fluid FN species containing the alternatively spliced EIIIA segment, these observations indicate that the ~170-kDa species includes sequences from four FN domains that have previously, in isolation, been observed to promote catabolic responses by chondrocytes in vitro: the N-terminal heparin-binding domain, the gelatin-binding domain, the central CBD, and the EIIIA segment. The ~170-kDa N-terminal species of FN may therefore be both a participant in joint destructive processes and a biomarker with which to gauge activity of the arthritic process. Fibronectins (FNs), a family of multifunctional adhesion proteins that differ from one another through alternative splicing of a pre-mRNA derived from a single gene, are found as soluble dimeric molecules in the blood and as insoluble multimers within the extracellular matrix of tissues, where they are concentrated in basement membranes and blood vessel walls [1–3]. They bind to cell-surface integrin receptors and participate in a variety of cellular processes, including adhesion, migration, transformation, and apoptosis, as well as wound healing, fibrosis, and hemostasis [1–5]. FN is deposited in cartilage from osteoarthritis (OA) [3, 6–9], and fragmented forms of FN have been detected in synovial fluid (SF) and articular cartilage from patients with OA and patients with rheumatoid arthritis (RA) [10–17]. On the basis of such findings, plasma-derived FN (pFN) and specific purified pFN fragments have been tested for their capacity to regulate the function of chondrocytes in vitro. Whereas intact, soluble pFN has been observed to exert little or no effect, several purified, proteolytically derived pFN fragments have proved to be active [18–26]. Additionally, mixtures of fragments derived from OA cartilage have been observed to promote chondrolysis in vitro . Although fragments corresponding to the 29-kDa (also referred to as 30-kDa) amino-terminal (N-terminal) heparin-binding domain (HBD) have been studied most extensively, species derived from sites spanning most of the FN molecule have been observed to trigger catabolic gene expression in chondrocytes [18–26]. For example, purified fragments of pFN corresponding to the 120- to 140-kDa central cell-binding domain (CBD), the 50-kDa gelatin-binding domain (GBD), and the 40-kDa C-terminal HBD have each been observed to trigger release of proteoglycans from cartilage slices in vitro, as has a recombinant version of the alternatively spliced EIIIA segment (Fig. 1) [18, 22, 25–27]. In addition, the 29-kDa N-terminal HBD has been observed to trigger gene expression for stromelysin, inducible nitric oxide synthetase, hyaluronan receptor proteins, and other biologically active molecules in cultured chondrocytes [20, 21, 23–26]. Chondrolysis triggered by FN fragments occurs in association with local release of catabolic cytokines, including tumor necrosis factor α, interleukin-1β, and interleukin-1α . Furthermore, intra-articular injection of either N-terminal or central CBD fragments into rabbit joints triggers loss of cartilage proteoglycan, whereas injection of intact, dimeric pFN does not [28, 29]. Structure of fibronectin (FN), including recognition sites for the monoclonal anti-FN antibodies used in this study. The structure of an intact FN subunit is shown, with the approximate binding sites for the three anti-FN monoclonal antibodies used in this study denoted by brackets at the top and binding specificities for various domains and structural motifs shown at the bottom. The primary FN sequence extends from the amino (N) terminus (NH2, left) to the carboxy (C) terminus (COOH, right) and consists of repeating motifs designated type I, II, and III repeats. In addition to the 10th (counting rightward from the N terminus) type III repeat, cell surface integrin-binding motifs ('Cell') have been localized to the alternatively spliced EIIIA and V segments. The cysteine residues through which subunits are dimerized are depicted near the C terminus. Our goal in this study was to characterize and compare the assortments of N-terminal SF FN species in samples from OA versus RA patients with respect to their domain structures and ligand-binding properties. We have found that, among the two predominant species of SF FN that bear sequences from the N-terminal HBD in patients with OA or RA, the smaller, ~170-kDa species binds less readily to gelatin and to a monoclonal antibody (mAb) specific for the GBD than does the larger, ~200+-kDa species. Furthermore, 2D electrophoretic analysis reveals the ~170-kDa species to be comprised of distinct subspecies, most of which extend sufficiently toward the carboxy terminus (C terminus) to include the 10th type III repeat within the central CBD. In addition to prominent ~200+- and ~170-kDa species, several additional forms of FN that bear sequences from the N-terminal HBD were detected in OA and RA samples. Each of the soluble species identified in this study, in addition to its possible roles in the promotion of arthritic joint injury, is a candidate as a biomarker for the arthritic disease process. This research was conducted according to the principles of the Declaration of Helsinki and was approved by committees overseeing human experimentation at the relevant institutions. After informed consent had been obtained, SF was taken from patients with OA or active RA who were undergoing diagnostic and/or therapeutic arthrocentesis at Long Island Jewish Medical Center, New Hyde Park, NY, or at Winthrop-University Hospital, Minneola, NY, USA. Fluid was drawn into plastic syringes and placed directly into tubes containing EDTA, phenylmethylsulfonyl fluoride (PMSF), and aprotinin at final concentrations 5.7 mM, 1 mM, and 500 U/ml, respectively (Sigma Chemical Co, St Louis, MO, USA). The fluids were centrifuged at 500 g, and supernatants were frozen at -80°C with the exception of short periods at -20°C. The 9 OA samples (numbered 1–9) and 10 RA samples (numbered 10–19) that were analyzed in this study were previously examined for their content of species of FN bearing the alternatively spliced EIIIA segment . Purified anti-FN mAbs specific for the N-terminal HBD (mAb 1936) (hereafter referred to as anti-N-terminal mAb) [1–3, 30] and the GBD (mAb 1892) were from Chemicon (Temecula, CA, USA) (Fig. 1). mAb A2C2, which recognizes the 10th type III repeat of FN , was a gift (as ascites) from Dr Richard Hynes, Massachusetts Institute of Technology, Cambridge, MA, USA. Purified proteolytic fragments from human pFN corresponding to the 30-kDa (equivalent to 29-kDa) N-terminal HBD, and a 45-kDa stretch from the GBD (Fig. 1), were from Sigma. To block nonspecific binding sites, 25 μl of gelatin–Sepharose (Amersham Pharmacia, Piskataway, NJ, USA) was rocked with 400 μl 1% bovine serum albumin (RIA grade, Sigma) in phosphate-buffered saline (PBS) for 30 min at room temperature. SF (50 μl) plus 1% BSA/PBS (225 μl) were then added to individual bead pellets, followed by PMSF, aprotinin, leupeptin, and EDTA, to give final concentrations of 2 mM, 9.9 U/ml, 13.3 μg/ml, and 4 mM, respectively. After rocking for 2 h, supernatant ('flow-through' [FT]) fractions were collected and bead pellets were washed four times with PBS containing 2 mM EDTA. Gelatin beads were boiled in 40 μl reduced sample buffer (40 mM Tris, pH 6.8, containing 4.3% SDS, 21.5% glycerol, 1 mM EDTA, and 0.2 M dithiothreitol) for 5 min prior to SDS–PAGE . This fraction was prepared from OA SF sample 6 as described, using sequential gelatin and heparin affinity chromatography, step-gradient NaCl elution of ~170-kDa N-terminal FN fragments from the heparin column, and Centriprep (Amicon, Beverly, MA, USA) concentration of the 250 mM NaCl fraction . One-dimensional (1D) and two-dimensional (2D) electrophoresis was performed as described elsewhere . Six volumes of FT, diluted six-fold during affinity isolation, were submitted to 1D SDS–PAGE alongside one volume of the corresponding SF. The weights of molecular standards (Gibco BRL, Rockville, MD, USA) are those reported by the manufacturer for prestained proteins. For 2D analysis, 5 μl of SF or FT obtained after affinity isolation from SF was added to 100 μl rehydration solution consisting of 2% immobilized pH gradient buffer, 8 M urea, and 2% CHAPS. Dithiothreitol (18.2 mM), PMSF (2 mM), and aprotinin (0.1 U/ml) were added to the rehydration solution just before the sample, and the mixture was centrifuged at 14,000 gfor 15 min and applied via sample cup to a 7-cm isoelectric focusing strip (pre-equilibrated overnight in rehydration solution) for focusing at 20°C in a Multiphor II apparatus (Amersham Pharmacia) at 200 V for 1 min followed by 3500 V for 170 min. After storage at -75°C, strips were incubated for 15 min in 50 mM Tris, pH 8.8, plus 6 M urea, 30% glycerol, 2% SDS, trimmed to exclude ~7 mm from the anodic end, and submitted to 5% SDS–PAGE with an overlay of 0.5% agarose in 25 mM Tris, 192 mM glycine, and 0.1% SDS. Proteins in 1D and 2D gels were electrophoretically transferred and stained as described elsewhere . 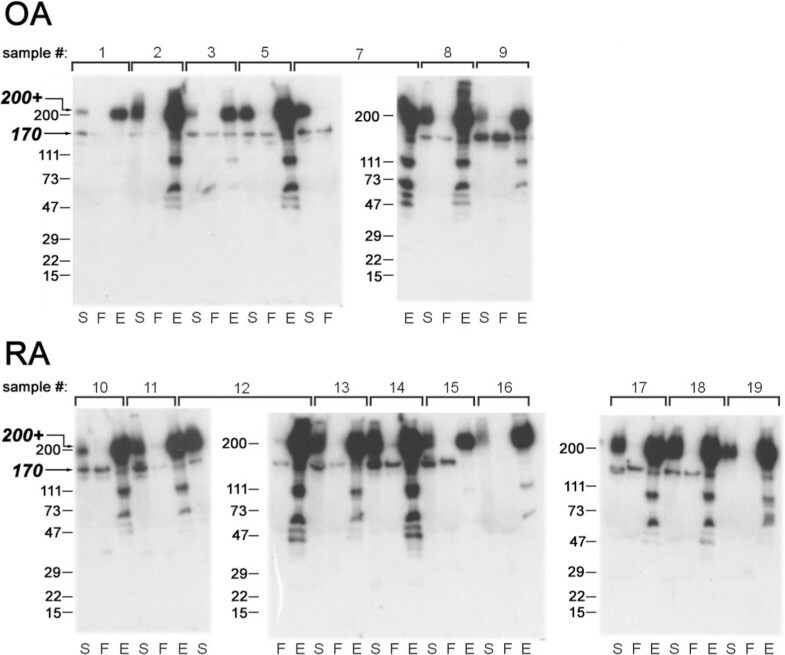 Nitrocellulose membranes that had been blocked, stained with primary antibodies, and washed with triethanolamine-buffered saline plus 0.05% Tween 20 (TBST) were incubated for 2 hours in TBST containing 125I-labeled donkey Fab' fragments specific for rabbit IgG, or whole rabbit IgG specific for mouse IgG (Amersham Pharmacia) at 0.15 to 0.5 μCi/ml; or horseradish peroxidase (HRP)-conjugated affinity-purified goat anti-mouse IgG (Jackson ImmunoResearch, West Grove, PA, USA). Membranes that had been incubated with iodinated antibodies were washed, dried, and exposed to XAR film (Kodak, Rochester, NY, USA) with an intensifying screen before development. Membranes that had been exposed to HRP conjugates were washed and overlaid with enhanced chemiluminescence (ECL) reagent and then exposed to Hyperfilm ECL (Amersham Pharmacia) for periods of 10 s to 10 min before development. Control membranes were stained with secondary antibodies only. Band densities were measured using a Phosphorimager (Molecular Dynamics, Sunnyvale, CA, USA). Quantitative data for OA versus RA samples is expressed as the average ± SD for each group. Statistical comparisons between groups were made with Student's t-test using Sigma Stat Version 2.0 statistical software. P values less than 0.05 were considered significant. Since the potential for a particular species of FN to regulate chondrocyte function may be related both to its capacity to be recognized by cell-surface receptors and to its ability to bind to other components of the extracellular matrix, we wished to compare the capacities of the various N-terminal species of SF FN to bind to gelatin (denatured collagen). This was assessed by comparison of the content of N-terminal species of FN in SF samples before and after exposure to immobilized gelatin. As we reported previously, 1D Western blot analysis of unprocessed SF reveals two predominant species in most OA and RA samples, possessing apparent molecular weights of ~200+ and ~170 kDa . Given the proximity of the GBD to the N terminus (Fig. 1) [1–3], both of these large N-terminal species would be expected to include gelatin-binding sequences. However, when samples of SF were subjected to affinity isolation on gelatin beads, the ~200+-kDa species was routinely observed to bind more readily than the ~170-kDa N-terminal species (Fig. 2). For example, in all nine OA samples, the ratio of staining intensities for ~200+- to ~170-kDa bands decreased in the gelatin-bead FT fraction in comparison with the starting material (Fig. 2, top panel). Furthermore, the average intensity of the ~170-kDa band in the FT was 61.5 ± 44.2% of the corresponding value in the starting material for the seven OA samples shown in Fig. 2, whereas FT fractions lacked visible staining for the ~200+-kDa species. ~170-kDa N-terminal species of fibronectin (FN) in samples of synovial fluid (SF) from patients with osteoarthritis (OA) or rheumatoid arthritis (RA) bind to gelatin less avidly than do larger species bearing sequences from the N-terminal heparin-binding domain. Samples of SF from patients with OA (samples 1–3, 5, and 7–9 in the upper panels) or RA (samples 10–19 in the lower panels) were mixed with gelatin Sepharose beads, flow-through fractions were collected, and the beads were washed and boiled in reduced sample buffer to elute bound FN species. 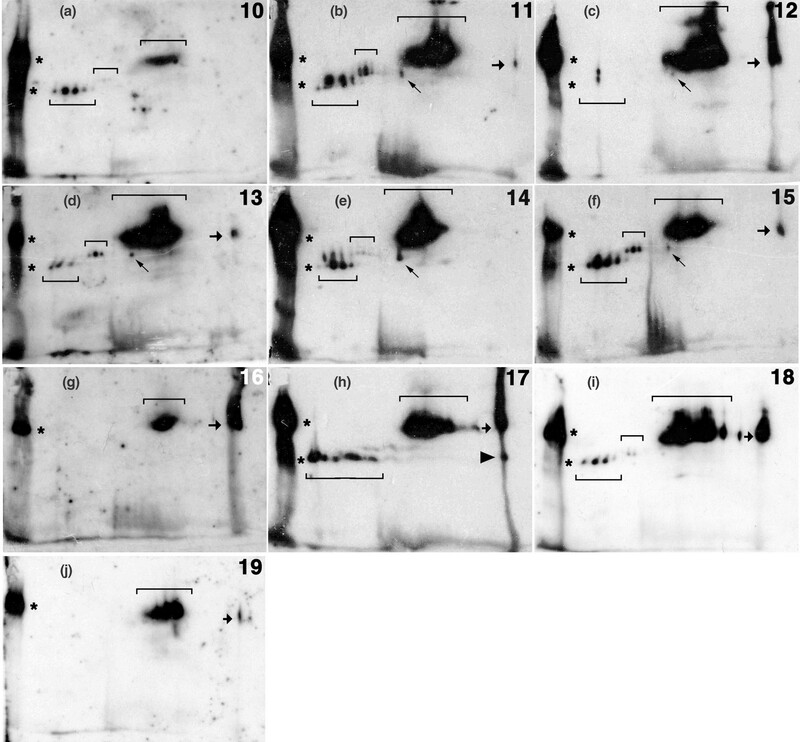 SF starting material ('S'), flow-through fractions ('F'), and bead eluates ('E') were then subjected to reduced 4–15% SDS–PAGE followed by Western blot analysis using mAb 1936 specific for an epitope in the N-terminal heparin-binding domain, followed by iodinated secondary antibodies. With the exception of RA SF samples 16 and 19, for which staining was restricted mainly to an ~200+-kDa band, the starting samples included two major species of FN, migrating at ~200+ and ~170 kDa, respectively. Whereas the ~200+-kDa band was stained more intensely than the ~170-kDa band in most samples, the flow-through fractions typically contained greater quantities of ~170- than ~200+-kDa species. Equivalent quantities of flow-through fractions and starting material were subjected to electrophoresis, whereas the volume of gelatin eluate was equivalent to four times the volume of starting material. OA samples 4 and 6 also exhibited lower '200+:170' ratios in flow-through fractions than in the starting fractions (not shown). The positions of molecular weight standards are denoted to the left of each panel, whereas the positions of the two predominant species of SF FN ('200+' and '170') are denoted by arrows to the left of the far left upper and lower panels only. The figure represents a composite derived from one autoradiagram, which was exposed overnight. Similarly, although RA samples 16 and 19 lacked sufficient staining of ~170-kDa forms to permit assessment, the ratio of staining intensities for ~200+- to ~170-kDa bands decreased in the FT fractions in comparison with the starting material in the remaining eight RA samples, with little or no staining for ~200+-kDa species in the FT fractions (Fig. 2, bottom). The average intensity of staining of the ~170-kDa band in the FT fractions averaged 81.5 ± 49.6% of the corresponding value in the starting material for the eight RA samples in which two major bands were detected by anti-N-terminal-HBD mAb (excluding samples 16 and 19). Reflecting the preferential gelatin-binding capacity of the ~200+-kDa species as opposed to that of the ~170-kDa species of SF FN, gelatin isolates from both OA and RA samples were uniformly enriched in the former as compared with the latter species. In addition to ~200+-kDa forms, fragments smaller than ~170 kDa were detected in gelatin isolates derived from 6 of the 8 OA samples and 9 of the 10 RA samples shown in Fig. 2. Specifically, gelatin-binding N-terminal fragments with apparent molecular weights of ~100, ~60, ~50, and ~47 kDa were detected in both OA and RA samples (Fig. 2). Similar to the staining pattern previously obtained on these same samples with anti-total-FN antibody , anti-N-terminal-HBD mAb was observed to produce preferential staining of the ~200+- as compared with the ~170-kDa species in both OA and RA SF samples. The ratio of staining intensities for the ~200+-kDa bands as compared with the ~170-kDa bands was significantly greater in the 10 RA than in the 9 OA samples (22.6 ± 35.0 and 3.8 ± 6.9, respectively; P < 0.05). Although the magnitude of this difference could largely be attributed to RA samples 16 and 19, which exhibited negligible staining for the ~170-kDa species, the average ratio for the remaining eight RA samples (6.2 ± 3.4) was also significantly greater than for the OA group (P < 0.05). Despite the use of gradient gels with the capacity to resolve species as small as ~15 kDa, little or no staining of forms of FN smaller than ~170 kDa was detected in unconcentrated SF samples by anti-N-terminal-HBD mAb (or anti-total-FN polyclonal antibody; not shown) after autoradiogram exposure times of 5 days (Fig. 2). Since FN exists in nature as dimers that are disulfide-bonded near their C termini (Fig. 1), information regarding the state of such bonds is not forthcoming in reduced electrophoretic analysis. When OA SF sample 6 was subjected to nonreduced SDS–PAGE, species bearing an N-terminal HBD sequence with migration expected of FN dimers and monomers predominated, in addition to a major species that migrated at a position expected for a reduced, ~140-kDa protein (Fig. 3a). The latter species appeared to equate with the ~170-kDa species seen in reduced electrophoresis, since an ~140-kDa band also predominated in the fraction enriched in the ~170-kDa species derived from the same sample , whether staining was achieved with anti-N-terminal-HBD or anti-CBD mAbs (not shown). Nonreduced analysis of species of osteoarthritis (OA) synovial fluid fibronectin (FN) that bear sequences from the N-terminal heparin-binding domain. (a) OA sample 6 was subjected to gelatin affinity isolation, and the starting material ('SM') and flow-through ('FT') fractions were submitted to 5% nonreduced SDS–PAGE followed by Western blot analysis in duplicate using monoclonal antibodies (mAbs) specific for the N-terminal heparin-binding domain ('anti-N-term') or the gelatin-binding domain (GBD) (mAb 1892, 'anti-GBD'). In the starting material and the flow-through fraction, the anti-N-terminal mAb recognized a fragment species with mobility expected of a reduced protein of ~140 kDa ('F'), in addition to dimeric ('D') and monomeric ('M') species. Although staining of all three species was less in the flow-through fraction than in the starting material, the reduction in staining of the dimeric and monomeric forms was substantially greater than for the fragment species. In contrast, the anti-GBD mAb produced staining of species with mobility expected of dimeric ('D') and monomeric ('M') FNs but did not stain a fragment species in the starting material or the flow-through fraction. The two pairs of lanes were derived from one autoradiogram, which was exposed overnight. Similar results, in which dimeric and monomeric species of FN were stained by anti-GBD mAb to the exclusion of the smaller fragment species, were obtained for OA samples 1, 4, and 9 (not shown). (b) Purified 30-kDa N-terminal heparin-binding ('30 K') and 45-kDa gelatin-binding ('45 K') fragments of human FN (2.5 μg each), as well as the 170-kDa-enriched fraction derived from OA synovial fluid sample 6 ('170 K') (5 μl) , were subjected to duplicate 4–15% nonreduced SDS–PAGE and Western blot analysis using mAbs to the N-terminal heparin-binding domain (left) or to the GBD (right). The anti-N-terminal mAb produced staining of the 30-kDa fragment and a species with migration expected of a reduced protein of ~140-kDa within the 170-kDa-enriched fraction, but failed to stain the 45-kDa fragment. In contrast, the anti-GBD mAb produced bright staining of the 45-kDa fragment, but failed to stain the 30-kDa fragment or material in the 170-kDa-enriched fraction. The 30-kDa fragment migrated faster than expected from the positions of migration of reduced molecular weight standards shown to the left of each panel, possibly reflecting the effect of maintenance of type I repeat intrachain disulfide bonds upon conformation under nonreducing conditions. Autoradiagram exposure times were 4 hours for the 30 K and 45 K lanes, and overnight for the 170 K lanes. SF was also analyzed under nonreducing conditions using an anti-GBD mAb (mAb 1892), which does not recognize FN under reducing conditions (manufacturer's information and unpublished observations, J Peters). In contrast to the anti-N-terminal-HBD mAb, which stained a major fragment species in addition to dimers and monomers, mAb 1892 produced staining of dimeric and monomeric species but did not recognize a faster-migrating fragment species, either in unprocessed SF or in gelatin FT (Fig. 3a). The failure of mAb 1892 to stain species of SF FN smaller than monomers did not stem from an inability to recognize the GBD in FN fragments, since this antibody retained the capacity to produce specific staining of a 45-kDa GBD-containing fragment (Fig. 3b). To provide greater electrophoretic resolution of N-terminal species of SF FN, each SF sample was submitted to 2D Western blot analysis using a pH 4–7 isoelectric focusing gradient in the first dimension, followed by reduced 5% SDS–PAGE in the second. Three major species of SF FN were typically detected in samples from both types of patient: a ~200+-kDa cluster of staining, corresponding to the ~200+-kDa species in 1D electrophoresis; a series of ~170-kDa spots corresponding to the ~170-kDa band; and a more faintly stained series of ~185-kDa spots (Figs 4 and 5; Table 1). 2D Western blot analysis of species of osteoarthritis (OA) synovial fluid fibronectin (FN) that contain sequences from the N-terminal heparin-binding domain (HBD). 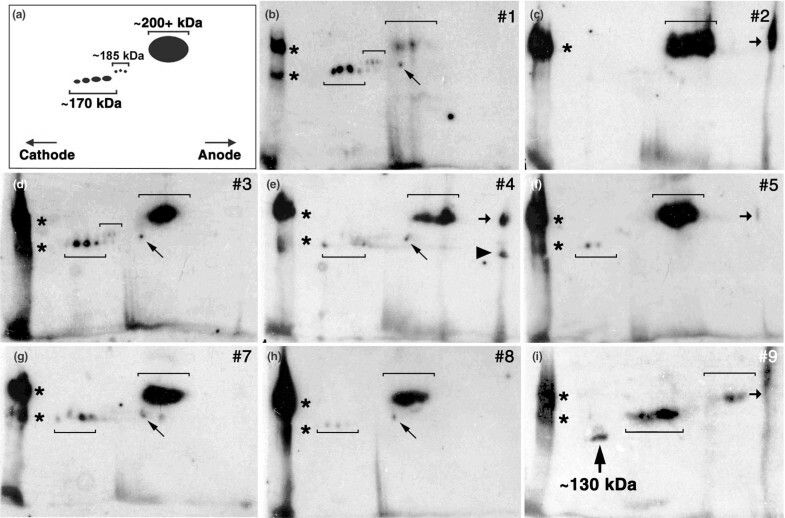 Samples of OA synovial fluid (5 μl) were subjected to isoelectric focusing in linear pH gradients followed by reduced 5% SDS–PAGE and Western blot transfer analysis, using anti-N-terminal-HBD mAb 1936 followed by iodinated secondary antibodies. Sample numbers are shown in the right upper corner of each panel. Except for sample nine, blots resulting from pH 4–7 first-dimension isoelectric focusing are presented. The pH 3–10 gradient used for sample nine (i) permitted detection of an ~130-kDa species which was also evident in the three other samples (OA samples 3, 5, and 8) that were submitted to pH 3–10 gradients (not shown). A portion of each synovial fluid sample (5 μl) was submitted to 1D electrophoresis in a lane at the left of each SDS–PAGE gel, and asterisks denote the approximate positions of migration of the ~200+- and ~170-kDa species in these lanes. At least part of the staining of material that migrated as a diffuse band at or near the dye-front in 1D lanes appeared to be nonspecific, since similar staining was present in 1D Western blot analysis of unconcentrated synovial fluid samples in the absence of primary mAbs (not shown). (a) Schematic diagram of the typical 2D migration of three predominant species of synovial fluid FN bearing sequences from the N-terminal HBD: (1) ~170-kDa (major cluster denoted by brackets facing upward): Eight of the nine OA samples contained between two and six ~170-kDa subspecies that migrated as a nearly horizontal array of spots in the cathodic half of the first dimension (pI ~6.0 to ~7.0). In sample number 2 (c), little or no such staining of a ~170-kDa species could be detected, and this correlated with an absence of staining of this species in the 1D lane. Additional ~170-kDa material that migrated much closer to the anode (pI ~4.3) was detected in samples 4 (arrowhead pointing to the right) and 9 (not visible in the pH 3–10 blot in panel i). A species possessing an apparent molecular weight slightly greater than 170-kDa (~180-kDa) was detected as a small spot beneath the cathodic aspect of the ~200+ kDa cluster in samples 1, 3, 4, 7, and 8 (diagonal arrows pointing upward and to the left). 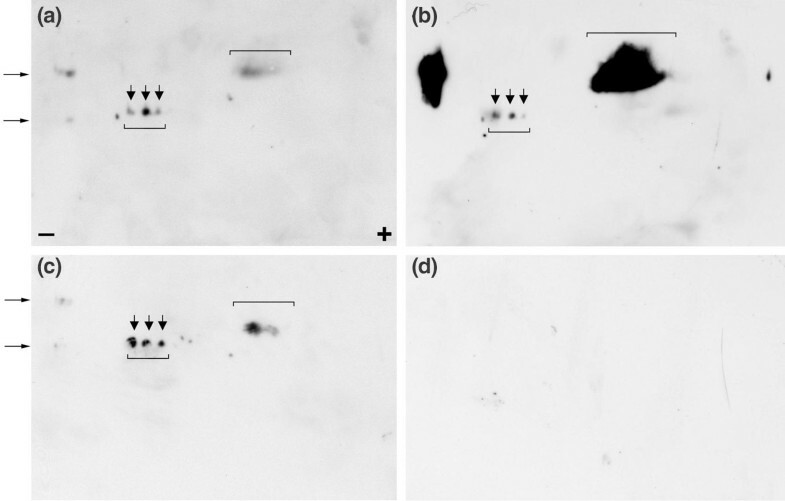 (2) ~185-kDa (denoted by small brackets facing downward): OA samples 1 and 3 (b,d), and 5 and 9 (f,g) (blots/exposures not shown) contained an additional fragment species, comprising between one and four faint spots. Similar to the ~170-kDa species, these forms migrated as a near-horizontal array of spots, but farther toward the anode and more slowly (Table 1). (3) ~200+ kDa (denoted by large brackets facing downward): This was detected in all OA samples tested, typically as a large and poorly defined cluster that migrated in the right upper quadrant of each blot. Additional material of ~200+ kDa that migrated farther toward the anode than the major 'cluster' is evident in samples 2, 4, 5 and 9 (c,e,f,i) (short arrows pointing toward the right) (see Table 1). Autoradiogram exposure times were 5 days for samples 1, 3, 5, and 8; 6 days for samples 2, 4, and 7; and 10 days for sample 9. A blot of OA sample 6 is not included in this figure, but can be seen in Figure 6. 2D Western blot analysis of species of rheumatoid arthritis (RA) synovial fluid fibronectin (FN) that contain sequences from the N-terminal heparin-binding domain. RA synovial fluid samples 10–19 were subjected to linear pH 4–7 first-dimension isoelectric focusing followed by reduced second-dimension 5% SDS–PAGE. After transfer, membranes were stained with mAb to the N-terminal heparin-binding domain followed by iodinated secondary antibodies. Sample numbers are shown in the right upper corner of each panel. Species of ~200+ kDa (large brackets facing down) that migrated at a position similar to corresponding species in OA samples (see Fig. 4) were evident in all 10 RA samples. An additional cluster of material of ~200+ kDa, denoted by short arrows pointing toward the right, was evident in samples 11–13 and 15–19 (see Table 1). This material was streaked upward in samples 12, 16, 17, and 18. Definitive staining of ~170-kDa species (large brackets facing up) was evident in samples 10–15, 17, and 18. Additional ~170-kDa material that migrated much closer to the anode (pI ~4.3) than the major cluster was evident in RA sample 17 (h) (arrowhead pointing toward the right). An additional species that possessed a molecular weight of approximately 180 kDa was detected as a spot beneath the cathodic aspect of the cluster of ~200+ kDa in samples 11–15 (diagonal arrows pointing upward and to the left) (see Table 1). An ~185-kDa species (small bracket facing down) is evident in samples 10, 11, 13–15, and 18. Autoradiograms were exposed overnight for sample 19, 2 days for sample 18, 4 days for samples 10, 13, and 16, 5 days for samples 11, 14, 15, and 17, and 6 days for sample 12. No definitive staining of ~170- or ~185-kDa species was observed in samples 16 or 19, even after exposure times as long as 10 days. aSamples of synovial fluid were subjected to two-dimensional electrophoresis in linear pH 4–7 isoelectric focusing gradients followed by reduced 5% SDS–PAGE and Western blot analysis using mAb 1936 specific for the N-terminal heparin-binding domain of fibronectin. OA samples 3, 5, 8 and 9 were additionally subjected to analysis using pH 3–10 linear first-dimension gradients, which permitted detection of a ~130-kDa N-terminal species (rightmost column). bThe numerator is the number of samples in which a particular species of FN was detected (+) and the denominator is the total number of samples tested. cFour OA samples and no RA samples were subjected to pH 3–10 gradients, which permitted detection of the ~130-kDa species. -, species not detected; NT, not tested. In SF samples from both patient groups, the ~200+-kDa N-terminal species was typically detected as a cluster that spanned a broad pI range (~4.9 to ~5.9) (Figs 4 and 5; Table 1). In 8 of 10 RA and 4 of 9 OA samples, a separate cluster of ~200+-kDa staining could also be detected migrating closer to the anode (pI ~4.0 to ~4.4) than the major cluster (Figs 4 and 5; Table 1). This 'extra' material was streaked vertically upward in the second dimension in four of eight RA (Fig. 5) and two of four OA (Fig. 4) samples. In most samples, the ~170-kDa species resolved into a cluster of one to six spots arrayed nearly horizontally in the second dimension, with pIs ranging from ~6.0 to ~7.0 (Figs 4 and 5). In the two SF samples for which gelatin FT fractions were submitted to 2D analysis (OA samples 1 and 3), these subspecies persisted in the absence of ~200+-kDa species (not shown). An additional ~170-kDa spot that migrated farther toward the anode (pI ~4.3) was detected by anti-N-terminal mAb in two OA samples (including sample 4 in Fig. 4; Table 1) and one RA (sample 17 in Fig. 5; Table 1) sample. Additionally, a spot that migrated slightly more slowly in the second dimension (~180 kDa, pI ~5.5–5.8) was detected in OA samples 1, 3, 4, 7, and 8, as well as RA samples 11–15 (denoted by diagonal arrows pointing upward and to the left in Figs 4 and 5; Table 1). In 4 of the 9 OA samples (1 and 3 in Fig. 4, also samples 5 and 9 in blots not shown; Table 1) and 6 of the 10 RA samples (10, 11, 13–15, and 18 in Fig. 5; Table 1), mAb to the N-terminal HBD produced staining of an ~185-kDa species that migrated slightly farther toward the anode (pIs ranging from ~5.8 to ~6.4) than the ~170-kDa cluster (Figs 4 and 5). A faint band corresponding to this species could also be detected in 1D Western blots subjected to long autoradiographic exposures (not shown) . Similar to the ~170-kDa cluster, the ~185-kDa subspecies persisted in the gelatin FT fraction from OA sample 1 (no staining of an ~185-kDa species was evident in the aliquot of OA sample 3 that was submitted to gelatin isolation), despite the absence of ~200+-kDa species from this fraction (not shown). In addition to pH 4–7 gradients, OA samples 3, 5, 8, and 9 were analyzed using pH 3–10 first-dimension gradients. In each case, a cluster of staining that migrated at ~130-kDa in the second dimension, and too close to the anode (pI ~9.1) to be evident in pH 4–7 gradients, was detected (sample number 9, Fig. 4i). Faintly stained ~130-kDa species were also detected in long exposures of 1D blots from these four samples (Fig. 1) . Anti-CBD and anti-N-terminal-HBD mAbs were observed to stain the same ~170-kDa spots in 2D analysis of OA sample number 6 (Fig. 6). Additionally, each of the two mAbs exhibited corecognition of ~170- and ~185-kDa species in RA sample 18 (not shown). Sequences from the N-terminal heparin-binding domain and the 10th type III repeat reside together within common subspecies of ~170-kDa synovial fluid fibronectin (FN) fragment. Aliquots of osteoarthritis (OA) sample number 6 (5 μl) were subjected to isoelectric focusing in duplicate pH 4–7 first-dimension (1D) strips, each of which was then subjected to reduced 5% SDS–PAGE. A portion (5 μl) of the sample was also submitted to reduced 1D PAGE in a lane at the edge of each of the two second-dimension gels. After incubation with anti-N-terminal heparin-binding domain mAb followed by HRP-conjugated secondary antibodies, similar enhanced chemiluminescence (ECL) staining patterns were obtained for the resulting two membranes (a, c) after a film development time of 1 minute. Specifically, two major bands were evident in the 1D lane, representing ~200+ (upper arrow) and ~170-kDa (lower arrow) species. Additionally, three major 'spots' (denoted by three vertical arrows), consistent with ~170-kDa species (brackets facing upward), were evident as a nearly horizontal array in the cathodic half of each membrane, approximating the point of migration of the corresponding species within the 1D lane. A cluster of staining with migration approximating that of the ~200+ kDa band was also evident in each membrane (brackets facing downward). The membranes were stripped of antibodies for 30 min at 50°C in 6.25 mM Tris pH 6.7 containing 100 mM β-mercaptoethanol and 2% SDS, then washed in TBST and reblocked with blotto. One was stained with mAb A2C2 diluted in blotto (panel B), whereas the other was incubated in blotto alone (panel D). After incubation with HRP-conjugated secondary antibodies, both membranes were again subjected to ECL development and film exposure for 10 min. 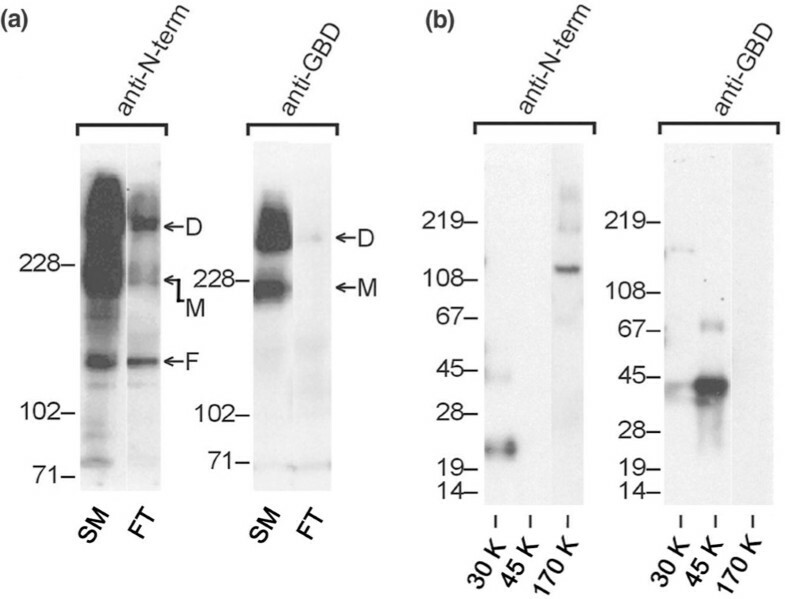 Staining was evident in the membrane that had been incubated sequentially with anti-CBD mAb followed by secondary antibodies (b), but not in the membrane exposed only to secondary antibodies (d). When the films shown in (a) and (b) were overlaid using membrane 'edge staining' as a guide, the three ~170-kDa spots present in (a) were found to occupy indistinguishable spatial positions as compared with the corresponding spots evident in (b). In comparison with the anti-N-terminal mAb, mAb A2C2 produced preferential staining of the ~200+ in comparison with the ~170-kDa species. Despite dramatic clinical and pathologic differences between the OA and RA, we have detected qualitatively similar arrays of N-terminal species of FN in SF samples from patients with the two disorders. Specifically, although there was a greater preponderance of ~200+-kDa as compared with ~170-kDa forms in RA versus OA samples, generally similar assortments of such species, ranging from ~47 to ~200+ kDa, were detected in the two types of sample both by 1D and 2D Western blot analysis. Therefore, the similarity in 2D electrophoretic resolution patterns that we previously reported for one patient with OA and another with RA  appears to be more generally applicable. 2D Western blot analysis revealed that samples of SF from OA and RA joints share in common at least six N-terminal species of FN (Table 1). One of the most prevalent, with a molecular weight of ~170 kDa, was found to usually be comprised of subspecies which, by antibody mapping in this and a previous study , appear to include sequences from four domains that have previously, in the context of small purified fragments or partial recombinant FNs, proved to be potent in the regulation of chondrocyte function, namely, the N-terminal HBD [18–20, 23, 24], the GBD , the central CBD [18–20], and the alternatively spliced EIIIA segment . The ~170-kDa species therefore appears structurally similar to a placenta-derived FN fragment that was previously observed to trigger expression of matrix metalloproteinase by synovial cells . Although the mechanisms by which FN fragments regulate chondrocyte function remain uncertain [25, 26], a close physical interaction has been detected between central cell-binding FN fragments and the α5 integrin subunit on chondrocytes in vitro, suggesting that surface-expressed integrins could constitute intermediaries in the transduction of catabolic signals from such fragments to chondrocytes . Such signal transmission could also emanate from sequences near the N terminus of FN, based upon the observation that N-terminal fragments lacking central CBD sequences are recognized by α5β1 integrins on fibroblasts . Although similar observations have not yet been reported for chondrocytes, α5β1 integrins are prevalent on the surfaces of chondrocytes in vivo and in vitro [35, 36]. Therefore, the ~170-kDa forms of FN described in this study could potentially be recognized by chondrocyte α5β1 integrins via sequences situated in both the central CBD and the N-terminal HBD. Elucidation of the primary sequence of all of the FN species detected in this study will provide more clues to their functions. Qualitatively similar assortments of FN species bearing sequences from the N-terminal HBD are present in SF samples from patients with OA and RA. One of the predominant species, possessing a molecular weight of ~170-kDa, is composed of distinct subspecies that have lesser capacities for gelatin binding than larger N-terminal species of SF FN. Since the ~170-kDa species has central CBD sequences, yet exhibits reduced binding to denatured collagen, it could potentially represent a soluble agent with the capacity to disrupt FN-mediated interactions between chondrocytes and their insoluble extracellular matrix. Based upon their potential roles in the pathogenesis of arthritis, the species described in this study also constitute candidate soluble biomarkers for the joint-destructive process in OA and RA. JHP was supported by a UCLA Claude Pepper Older Americans Independence Center, NIA #P60 AG10415, a gift from the Charles B See Foundation, and a Career Development and a Merit Review Award, both from the Department of Veterans Affairs; TJH was supported by a VA Merit Review Grant; and SC was supported in part by the Arthritis Foundation, Long Island Chapter. We wish to thank Dr Richard Hynes for his generous gifts of antibodies, Dr Livingston Van De Water for his critical reading of the manuscript, and Jerry Sproul of the West LA VAMC Geriatric Research, Education and Clinical Center for his fine assistance with computer graphics.